Ambitious paper piece project for 2nd round. As a previous blog showed you my 2nd paper pieced project was a large quilt from Judy Niemeyer called Cattails in the Meadow. I really enjoyed making this quilt. Judy’s directions are very simple to follow. As I made this quilt last winter I took a photo diary of my progress. 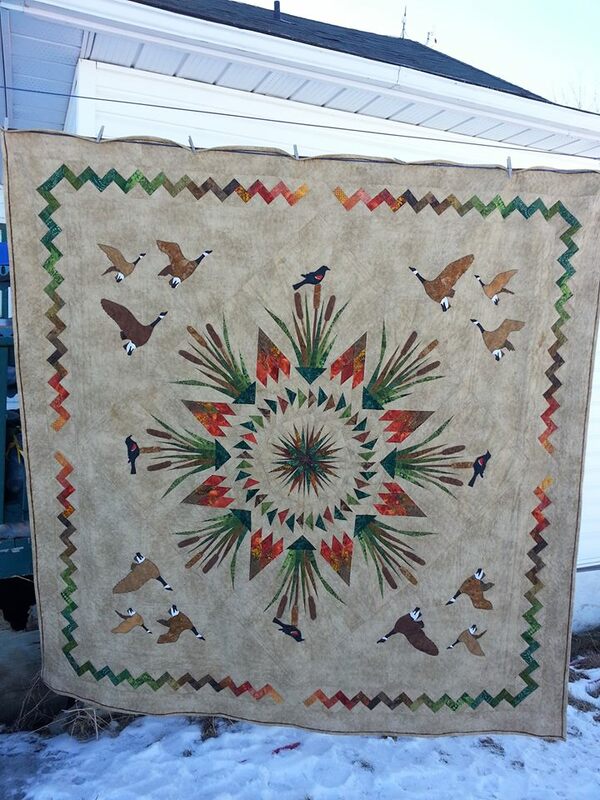 In Aug 2014′ The Pattern was purchased from a Shop Mamis Country Quilts in Duck Lake Saskatchewan. I was actually able to haul my husband into their and he chose the pattern. In October 2014 I did a Northern Alberta Shop Hop with a few of my fellow quilt guild members. This was a blast. During this road trip I purchases all the materials for this quilt. November 16 I started my project. my 1st piece done thistle patch. The cutting went well. I did figure that if I added extra then I could reverse my blades and save on fabric. Section 2 done. I can’t believe I’ve been sitting on this pattern and materials since February last year. This is so easy. Section 3 Almost time to call walk away for a bit. Making mistakes. Just glad I photocopied units or I would have been hooped . Heres where I’m at the moment. Part 4 finished. 1st time for me to use freezer paper to applique. A few burned fingers but over all went well. Just a few more sets of cattails and I start on the border. I got side tracked… adding my own touches to the corner cattail blocks. What ya think? Progress thus far. All the pieces are sewn together. Now to start on the border. Borders almost done. These took a little longer I timed myself at 30 minutes for a set of left and right of each color. I havent sewn it all together but this gives me a good idea what size it will be. At the moment I have it at 84″ square. I’m aiming for 104 all ill need to add is 10″ background border on each side. Adding my own touch again. Filling in corners at the same time. Quilting Done…. I quilt all my quilts on my domestic Pfaff Expression 150. The largest I’ve done is 104×108 inches. Next Quilt show purchase brings my mom to tears. Thanks Arianne. I thought it was just too plain otherwise. I got the geese pattern from a shop up in Alaska. I had to enlarge them so the proportion was correct for the quilt.